Steve Blank I’ve seen the Promised Land. And I might not get there with you. I’ve seen the Promised Land. And I might not get there with you. The startup founder who gets fired just as his/her company is growing into large company could be a cliché – if it wasn’t so true – and painful. Let’s take a look at why. Full disclosure: I’ve worn all the hats in this post. I’ve been the founder who got fired, I’ve been on the board as my friends got fired and I’ve been the board member who fired the founders. When Startups reach the Transition stage, it’s time to look inward and decide whether the current CEO and executive staff are capable of scaling to a large company. To get to this Transition stage, the company needed passionate visionaries who can articulate a compelling vision, agile enough to learn and discover in real time, resilient enough to deal with countless failures, and responsive enough to capitalize on what they learned in order to secure early customers. The good news is this team found a business model, product/market fit and a repeatable sales model. What lies ahead, however, is a different set of challenges: finding the new set of mainstream customers on the other side of the chasm and managing the sales growth curve. These new challenges require a different set of management and leadership skills. Critical for this transition are a CEO and executive staff who are clear-eyed pragmatists, capable of crafting and articulating a coherent mission for the company and distributing authority down to departments that are all driving toward the same goal. By now, the board has a good sense of the skill set of the CEO and executive team as entrepreneurs. What makes the current evaluation hard is that is based not on an assessment of what they have done, but on a forecast of what they are capable of becoming. This is the irony of successful entrepreneurial executives: their very success may predicate their own demise. 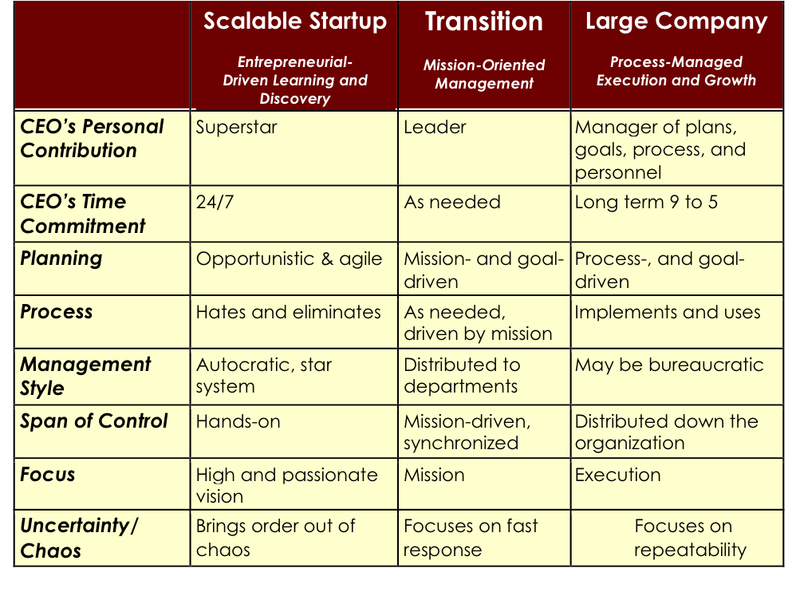 The table below helps elucidate some of the characteristics of entrepreneurial executives by stage of the company. One of the most striking attributes of founders is their individual contribution to the company, be it in sales or product development. As technical or business visionaries, they are leaders by the dint of their personal achievements. As the company grows, however, it needs less of an iconoclastic superstar and more of a leader who is mission- and goal-driven. Leaders at this Transition stage must be comfortable driving the company goals down the organization and building and encouraging mission-oriented leadership on the departmental level. This Transition stage also needs less of a 24/7 commitment from its CEO and more of an as-needed time commitment to prevent burnout. Planning is another key distinction. The Scalable Startup stage called for opportunistic and agile leadership. As the company gets bigger, it needs leaders who can keep a larger team focused on a single-minded mission. In this mission-centric Transition stage, hierarchy is added, but responsibility and decision making become more widely distributed as the span of control gets broader than one individual can manage. Keeping this larger organization agile and responsive is a hallmark of mission-oriented management. This shift from Customer and Agile Development teams to mission-centric organization may be beyond the scope and/or understanding of a first-time CEO and team. Some never make the transition from visionary autocrats to leaders. Others understand the need for a transition and adapt accordingly. It’s up to the board to decide which group the current executive team falls into. This assessment involves a careful consideration of the risks and rewards of abandoning the founders. Looking at the abrupt change in skills needed in the transition from Customer Development to a mission-centric organization to process-driven growth and execution, it’s tempting for a board to say: Maybe it’s time to get more experienced executives. If the founders and early executives leave, that’s OK; we don’t need them anymore. The learning and discovery phase is over. Founders are too individualistic and cantankerous, and the company would be much easier to run and calmer without them. All of this is often true. It’s particularly true in a company in an existing market, where the gap between early customers and the mainstream market is nonexistent, and execution and process are paramount. A founding CEO who wants to chase new markets rather than reap the rewards of the existing one is the bane of investors, and an unwitting candidate for unemployment. Nevertheless, the jury is still out on whether more startups fail in the long run from getting the founders completely out of the company or from keeping founders in place too long. In some startups (technology startups especially), product life cycles are painfully short. Regardless of whether a company is in a new market, an existing market, or a resegmented market, the one certainty is that within three years the company will be faced with a competitive challenge. The challenge may come from small competitors grown bigger, from large companies that now find the market big enough to enter, or from an underlying shift in core technology. Facing these new competitive threats requires all the resourceful, creative, and entrepreneurial skills the company needed as a startup. Time after time, startups that have grown into adolescence stumble and succumb to voracious competitors large and small because they have lost the corporate DNA for innovation and learning and discovery. The reason? The new management team brought in to build the company into a profitable business could not see the value of founders who kept talking about the next new thing and could not adapt to a process-driven organization. So they tossed them out and paid the price later. In an overheated economic climate, where investors could get their investments liquid early via a public offering, merger or acquisition, none of this was their concern. Investors could take a short-term view of the company and reap their profit by selling their stake in the company long before the next crisis of innovation occurred. However, in an economy where startups need to build for lasting value, boards and investors may want to consider the consequences of losing the founder instead of finding a productive home to hibernate the creative talent for the competitive storm that is bound to come. Instead of viewing the management choices in a startup as binary—entrepreneur-driven on Monday, dressed up in suits and processes on Tuesday—the Transition stage and mission-oriented leadership offers a middle path that can extend the life of the initial management team, focus the company on its immediate objectives, and build sufficient momentum to cross the chasm. We’ll cover the details in a future post. I think the ability to let go is an important quality for entrepreneurs to cultivate. The ability to just know when it’s time to move on emotionally, career-wise, etc, AND actually do so will save them much anguish in the short and long run. This ability will serve them well here as well as in life. Very thought provoking stuff Steve. Strange to look at your table, identify with the founder who will not scale in pretty much every category…I do take pride in being awesome at stage 1, and I guess if I had my druthers, I would turn over the reigns 3 or 4 times in my entrepreneurial career. My question is: do the guys who rock at step 1 tend to mature into star large company CEOs as they age, or are these two completely different animals? I guess, does the star founder grow up and learn to appreciate process driven execution? Most founders don’t make to the large company stage – either because their boards removed them before they got the chance or because they didn’t have the skills. The trauma is that most founders naturally believe that they _should_ continue as the CEO, regardless of company size. I know I did. Finally, later in my career I realized that I was great at the “Scalable Startup” phase and actually hated the bureaucracy of a large company. At E.piphany my partner Ben and I decided – even before we got funded – that we were going to bring in a big company CEO if we were successful. And we found the perfect guy. Digging deeper you’ll most likely find that most of the founders who made it as big company execs surrounded themselves with a world-class executive staff that did the big company execution. I agree with the premise here, especially around the stages of transition. However, I’m not sold on the idea of removing the founding CEO because you are entering a different phase. Think of all the great companies over the last century and many of them have an inventor or CEO who takes it from nothing to that of greatness. Can you imagine a board removing one of these individuals after the scalable startup phase: Bill Gates, Larry Ellison, Jeff Bezos, Mark Benioff, Michael Dell. Outside of tech, think about Walt Disney, Henry Ford, Sam Walton, Andrew Carnegie, JP Morgan, etc.. You can probably name a list refuting the argument but I believe vision, passion, determination, and leadership are the most critical qualities for the CEO regardless of the phase. Do large companies *have to* function in a bureaucratic manner? Is there a way for a large company to function more like a start-up? Or maintain much of the qualities from a start-up in the corporate culture? Any insight on how to tell when these transitions should begin? Risk Taker. Caretaker, Surgeon, Undertaker. Each role has a right time at the corporate tiller. Thanks for providing a positive blueprint for managing founder transition through the company growth. Success stories of founders going the distance are out there. One thing is to be sure: those who believe it cannot be done will not be the ones to do it. “Founder instinct” is really great term. Can any company keep innovate, disrupt and take risks without it? There are two promised lands actually: product land and financial land. If the founder got at least one, it’s OK (e.g. M&A). But removed from steering the boat only to see it sunk by somebody else, without any compensations, that’s tragic. Leaders do the right things. BTW, that specific transition stage took 40 years. In the desert. Great stuff Steve…I’ve seen this cycle over and over. I think some key indicators of success or failure has to do with the founder’s ability to recognize whether they’re able to move through transition and into more steady-state roles. Should be a required conversation for all founders and VCs to have pre-funding, IMO. I think it’s important that when a company comes through the Transition phase (something which I call Whitewater), that it doesn’t lose the creativity and innovation brought by the founder and rely completely on systems and processes. When this happens the organization can run the risk of becoming arthritic and brittle. A large company doesn’t have to be bureaucratic and it is possible for one to behave more like a start-up. For this to happen there has to be a fine balance between the creativity and vision of the founder and the systems and processes needed to steer a large organization. I think the number of “exceptions, […] who grew into large company executives while retaining founder instincts” is much larger than you make believe. I also think it would be better to point to examples in favour of your hypothesis, i.e. companies were the wrong kind of leadership caused the trouble. So what happens to a founder’s stake in the company when they are fired or pushed to a lesser role? Are they like everyone else where they lose their non-vested stock, or is there preferential treatment? What kind of positions within the company do founders normally take up? I guess what happens to the entrepreneur’s shares when they are forced out depends on what they negotiated in their term sheet when they accepted the investors money. I’m sure their unvested portion and a good chunk of options will go to the newly hired CEO. I don’t know if there is a standard term in a term sheet covering this but the entrepreneur and his or her lawyer should probably have something in the terms to cover their interests. Here is a 4 part video about term sheets and how they are changing. At the end of part 3 they talk a little about forcing the entrepreneur out. It seems to me that we can name far more companies that rose to greatness with initial founders than companies that rose to greatness with hired CEO and fired founders. Cisco is only one example that comes to mind. Sure, remain as the CEO with all the vision and drive, but ensure you have a COO from a solid corp backgroud. Or, move up to the position of Chairman/President and allow the experienced team to take over CEO/COO roles. Brin & Page have Schmidt, Gates had Ballmer, not sure who Ellison or Jobs had but I’m pretty sure there was someone. The kind of team that you are looking for you replace you, I think these are people who should of been entrepreneurs in their younger life but for some reason got sucked into corp life and adapted well. When they get a position in transitional startup they will shine on both sides. Call me kooky but I expect competitive web tech businesses to self disrupt their own markets to remain competitive. The gradients of network change are accelerating, and larger BigCo thinking won’t be able to adapt as quickly. Business evolution will favor the small and lean, where the wild eyed founders flourish. Agree with your post except that I think an experienced entrepreneur who recognizes his/her shortcomings can stay inside a company in a role other than CEO and continue to provide a very necessary perspective and skill set as the company grows to the next step. There are lots of examples of this working (and lots where it hasn’t) where I believe the main reasons for the success are that first the founder understands, accepts and wants to the company to continue thrive with him/her in the new role and second the incoming CEO respects, values and listens to the perspective of the original founder. A little bit of common sense, please. If you have problems with the founder and the guy is enough open-mind, maybe is better to put a coacher than to fire him. Too dangerous. And at the end of the day… is just one person, so is not an intelligent decision to fire her/him. Also, remember that some of the biggest companies in the world are still leaded by the founders. There is too much bloggers / vissioners / tompeters / super-investors and CEOs that they know what to do in every situation… but they don’t explain that they got much more failures than success. Very good auto.sellers. Very bad managers. Follow exactly what they advice, and you will kill your company. Some people have lack of imagination and skills, and they have to follow books, or biblias or corans like a fanatics. This happens also in management. When you face a situation in a company, don’t follow all what the books or experts are saying; use the common sense. Unfortunately, common sense is the least common of the senses.